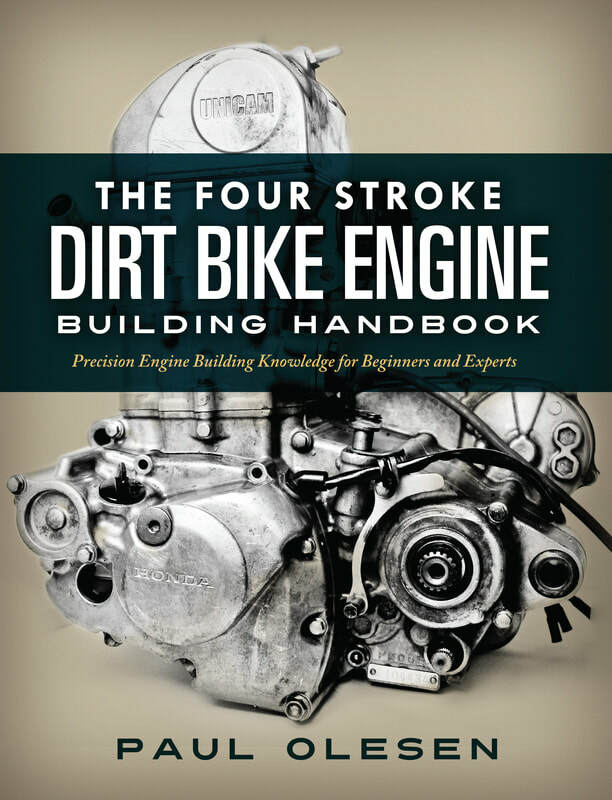 With the highly tuned state of the modern four-stroke dirt bike engine, correctly building a strong and reliable engine is becoming increasingly complicated. 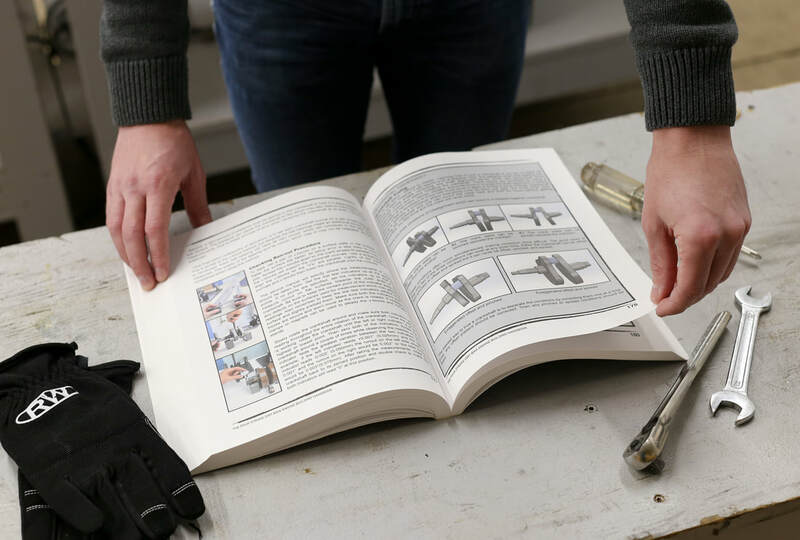 Unless you've been brought up in a world surrounded by engineers and engine building professionals, having the correct knowledge at your fingertips is nearly impossible. That's why we created this handbook for you. 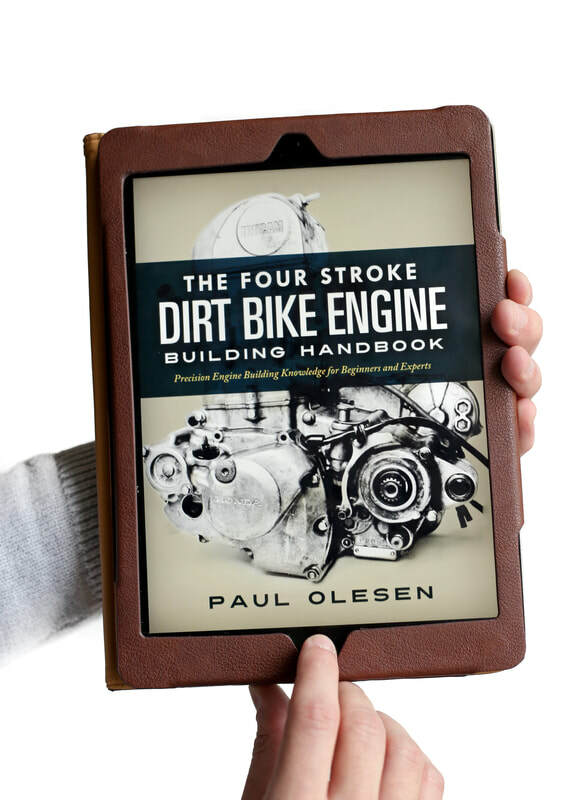 Brought to you by powertrain engineer, Paul Olesen, this book contains up-to-date professional knowledge and hands-on tips currently used in the industry. 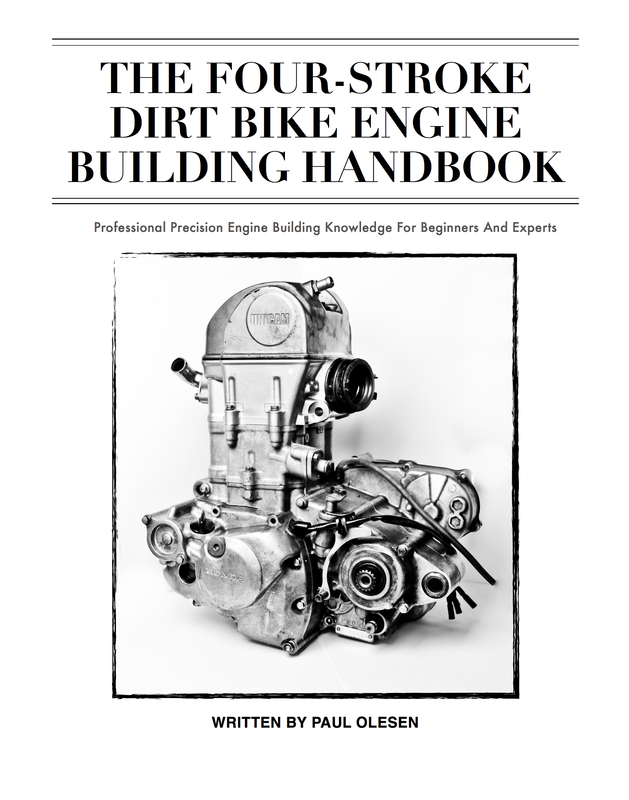 The Four Stroke Dirt Bike Engine Building Handbook is the most comprehensive guide for dirt bike engine building available, whether you are working at home or as a professional in a shop. 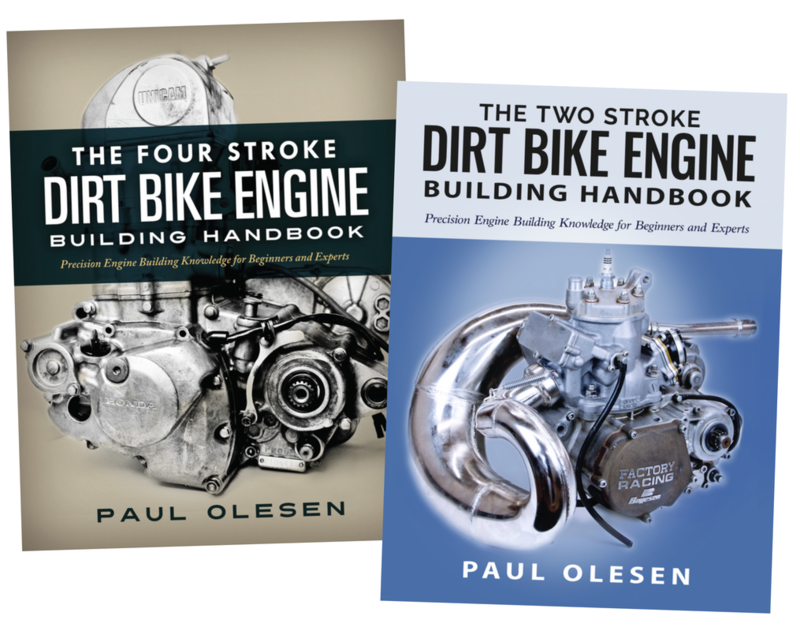 The process of building four-strokes to race engine quality is explained in-depth in this thoroughly illustrated handbook. JOIN THE 900 OTHER RIDERS WHO HAVE SUCCESSFULLY REBUILT THEIR FOUR-STROKES. 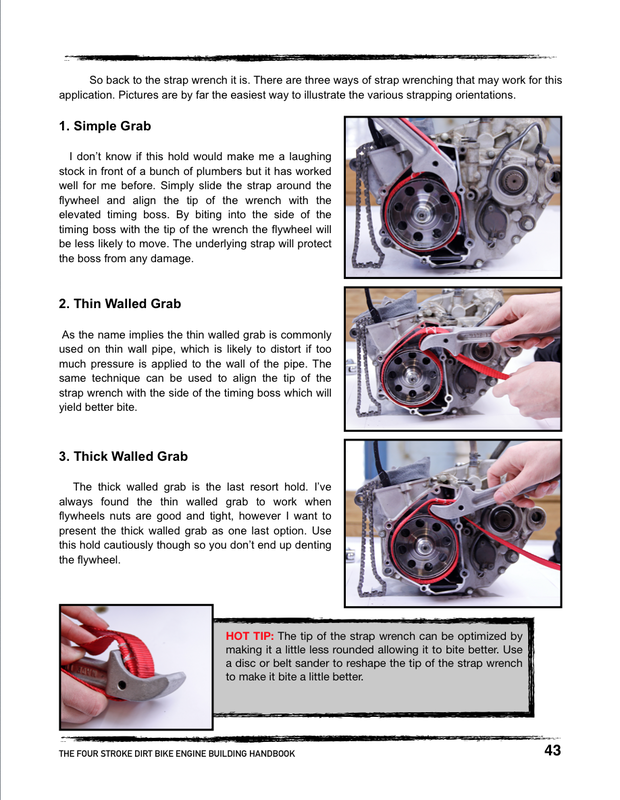 When To Rebuild - a detailed list of the ways to diagnose whether your four stroke is due for a full rebuild, to help you understand the warning signs and symptoms your bike may be exhibiting. 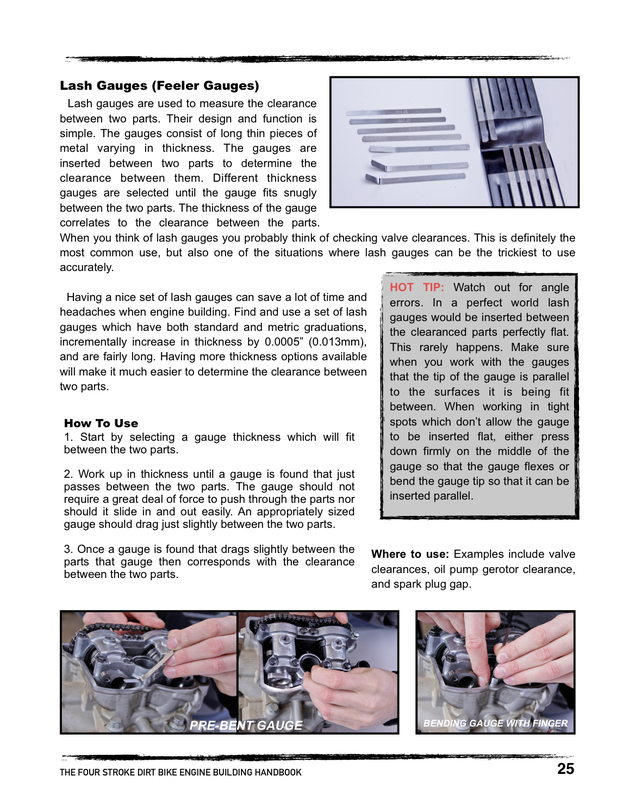 Tests to Help Determine Engine Health - a comprehensive guide that takes you through how to perform a Leak Down Test as well as a Compression Test, complete with full color pictures and detailed instructions. 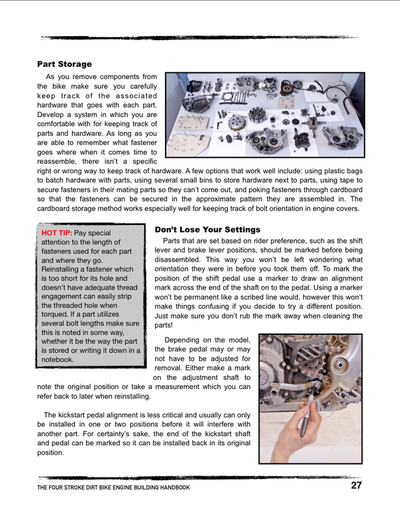 What Should Be Replaced - a detailed guide on what components will be replaced when doing a full rebuild on a dirt bike engine. 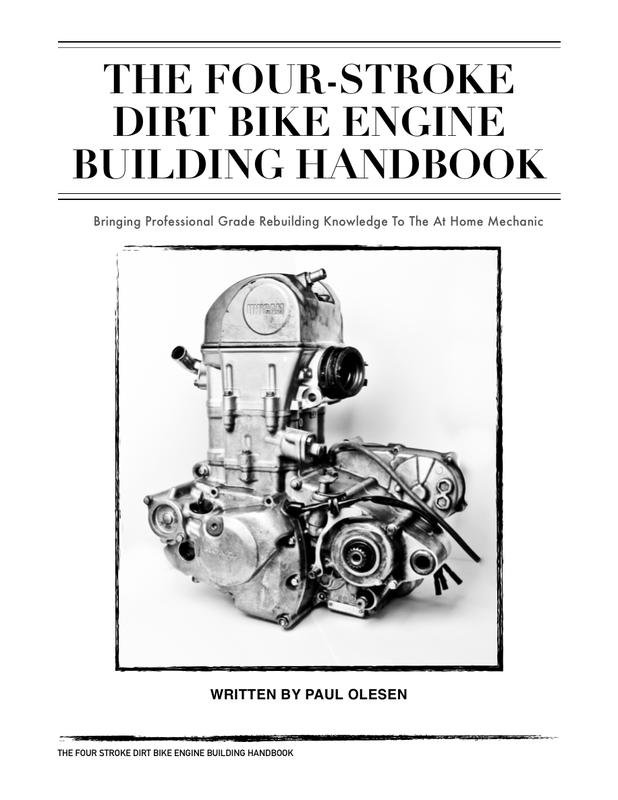 What Tools Do I Need - an in-depth overview on all the necessary tools to correctly teardown, inspect, and rebuild a four stroke dirt bike engine. 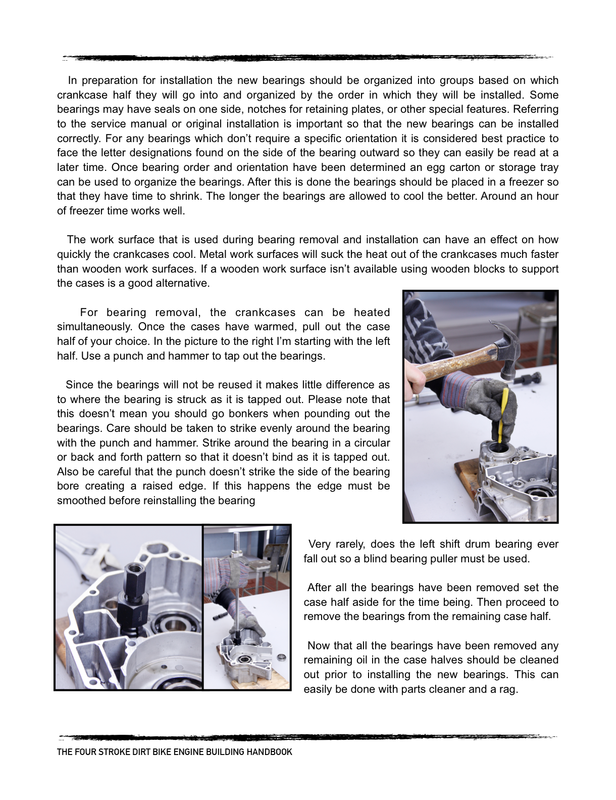 Full Teardown - a complete overview on correct teardown procedures for any four stroke make and model. Including how to remove the engine from the frame, tips and tricks for keeping track of all hardware and parts, how to properly remove components from the engine as to not damage gasket surfaces, important measurement and inspection points, how to correctly remove the flywheel and piston, and how to properly split the crankcases. 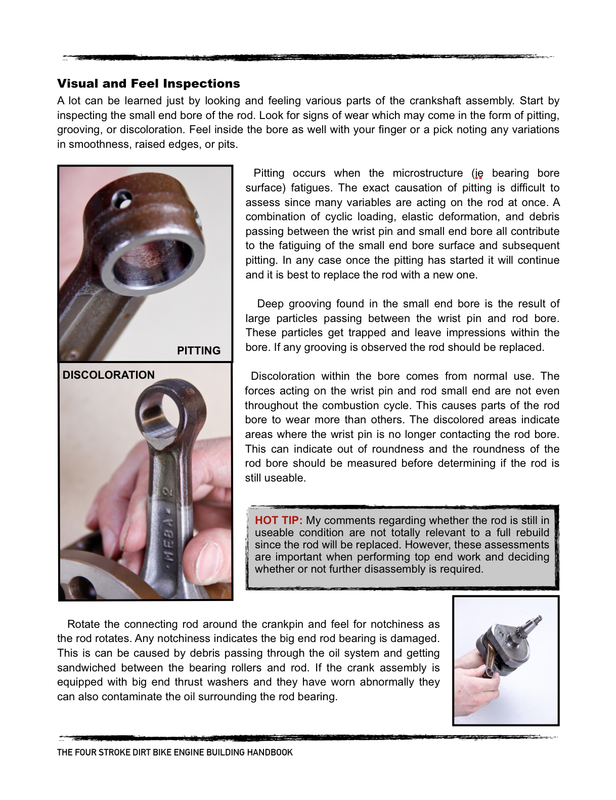 Complete Inspection, Replacement, and Assembly of Sub Assembly Components - a step-by-step thorough investigation of how to identify problematic wear patterns on old parts to help pinpoint causes of engine problems or failures. 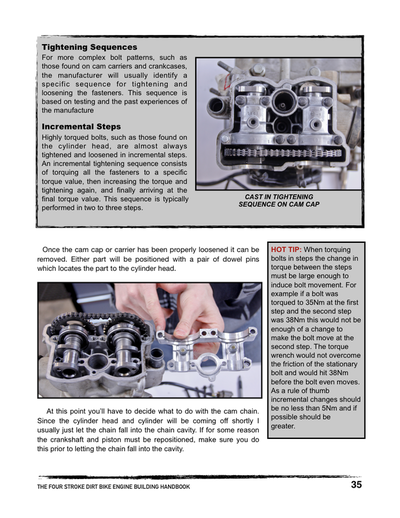 Also covered is how to correctly build up subassemblies including such components as the crankcases, transmission, crankshaft, cylinder, oil pump, kickstart, clutch, balance shaft, and cylinder head. 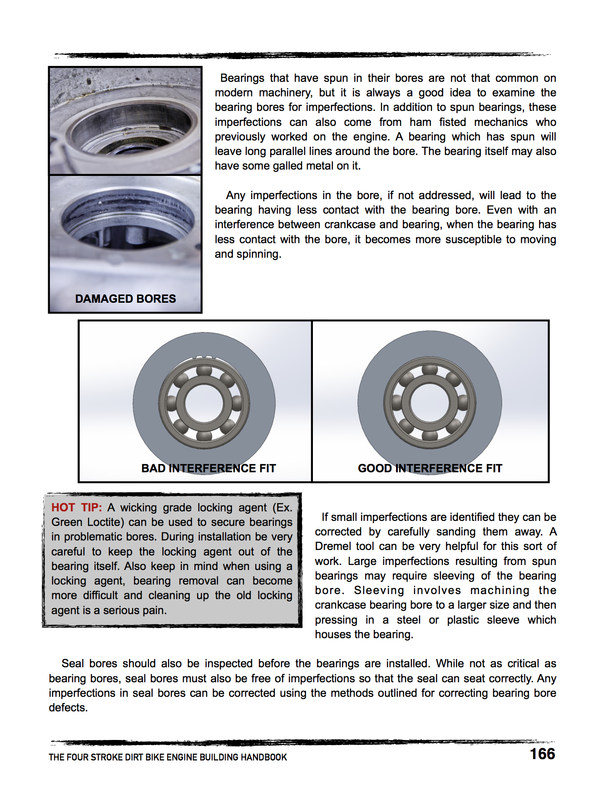 In addition, procedures on how to improve or repair your engine components are covered. 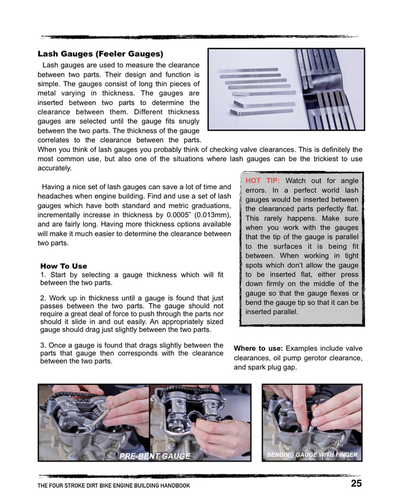 Examples include how to true crankshafts, hone cylinders, and repair damaged crankcases. 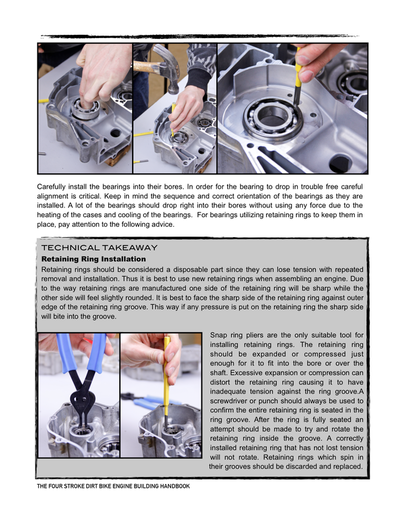 Reassembly - detailed instruction on how to correctly reassemble the engine and install it back into the frame. Race engine building techniques are also covered in detail and include timing the engine, checking the compression ratio, and checking piston to valve clearance. 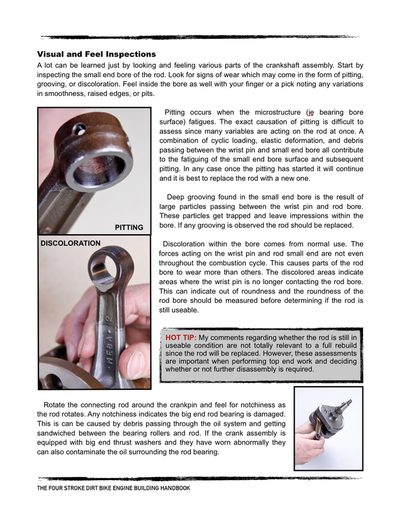 Diagnosing engine problems and picking up on subtle signs of wear can be frustrating if you don't know what to look for during a build. In this book we take you through key inspection points, explain why a part has worn or failed, provide examples, and give you a solution on how to fix the problem. You learn not only the correct way to rebuild your engine, but also the technical reasons why things are done the way they are in the engine building world. 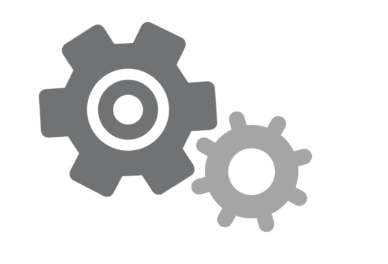 Whether you are a beginner or an expert, all techniques presented are guaranteed to increase your knowledge throughout your build. In addition, you learn valuable information not found in service manuals for building high performance racing engines, such as crankshaft truing, setting cam timing, checking the compression ratio, and checking piston to valve clearance. 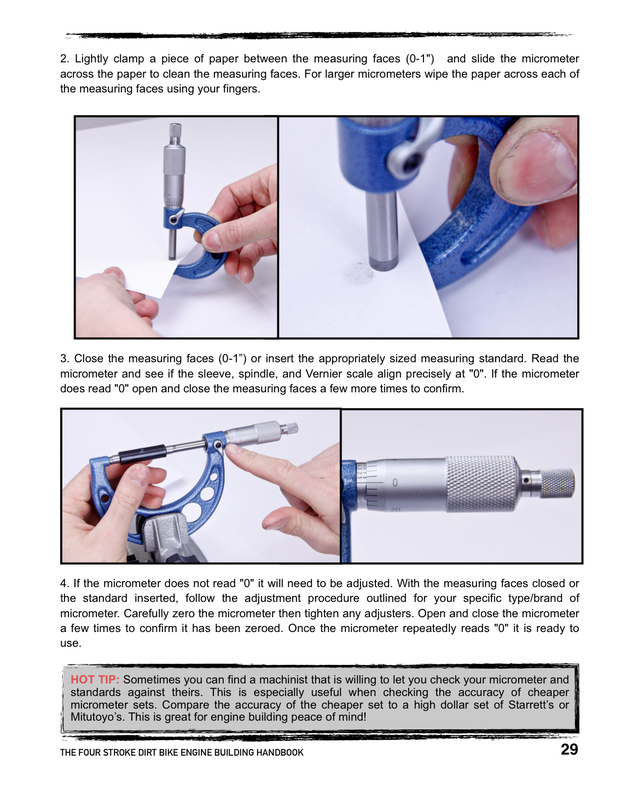 Having this book will also prevent you from making the common mistakes that many at-home mechanics unknowingly suffer from when rebuilding. 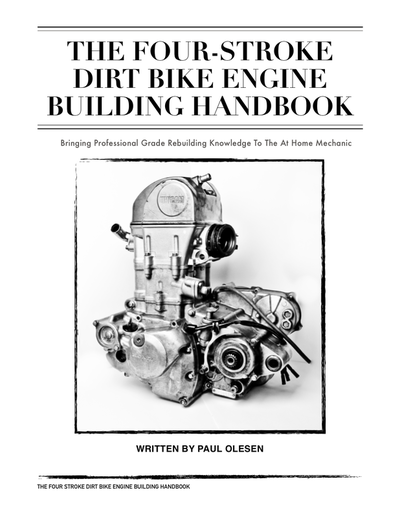 Reading and implementing the information in this book will make you a more educated builder, enable you to make informed decisions throughout your build, and keep you on track so you can build a powerful and reliable engine. 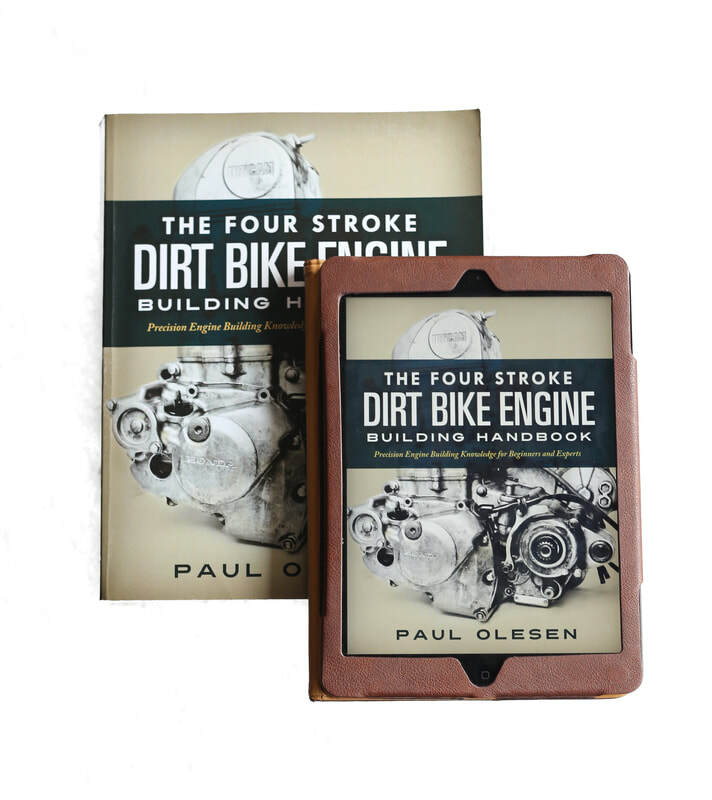 Paul Olesen loves helping others learn more about their machines to ultimately enable them to work on their own bikes. 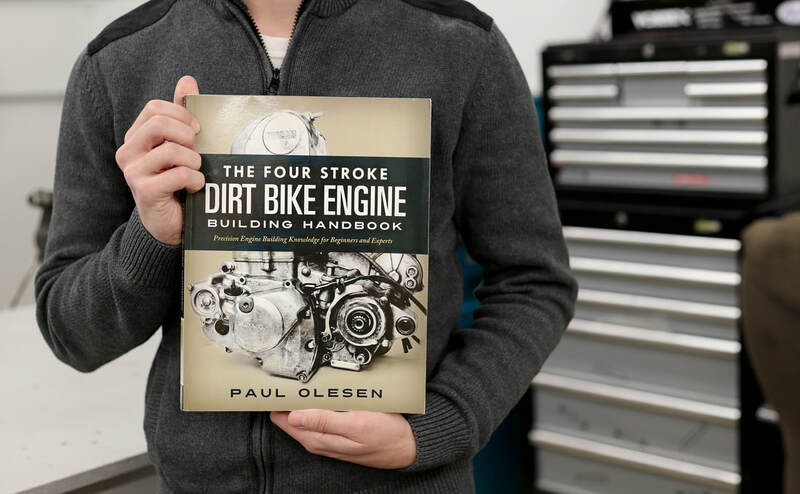 After resigning from his position as a powertrain engineer at Erik Buell Racing, Paul felt there was a serious need to bring deeper awareness and education to the everyday motor head. By day, he's finding ways to put the power back into the rider's hands. 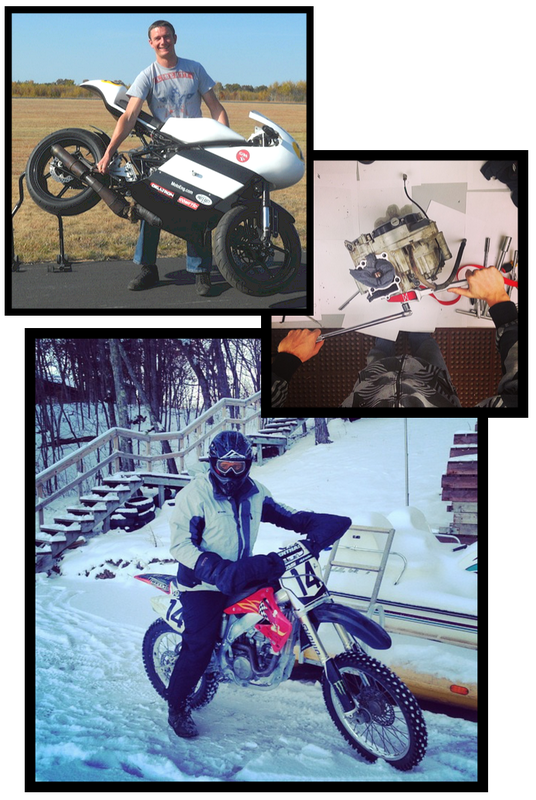 By night, Paul is focusing on engine development, racing, and building his own race bikes. 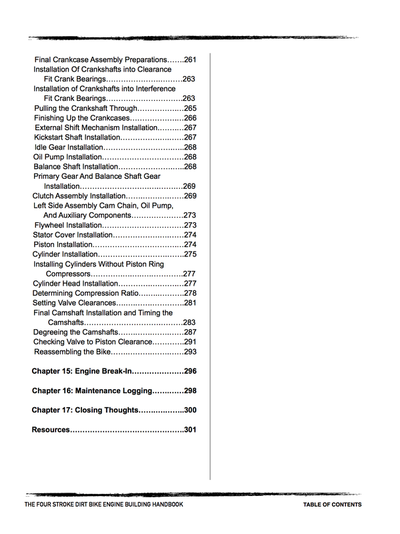 Order the print book, an 8.5" x 11", 2.3lb book full of engine building knowledge. 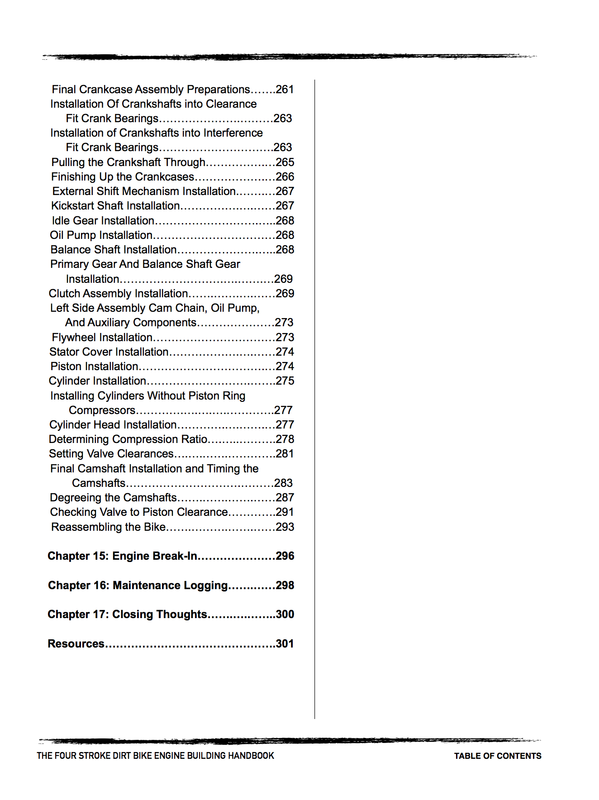 Full color pictures, thick pages, and high quality construction designed to withstand heavy shop use. Available to purchase through Amazon or directly from us. Did we mention it is nearly an inch thick? 301 pages of engine building knowledge navigable by the click of a mouse. 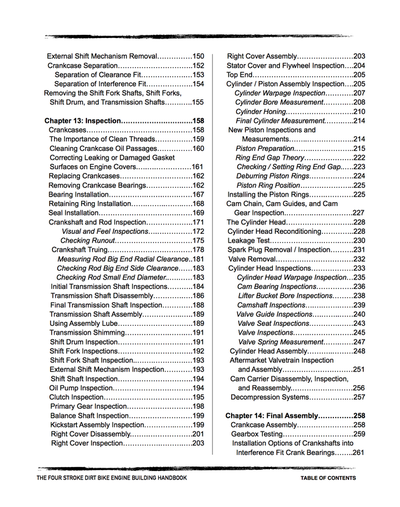 Search keywords, navigate using the clickable table of contents, and enjoy the book right on your computer, tablet, or mobile device. The print book is 8.5" x 11" and nearly an inch thick. It weights 2.3lbs. 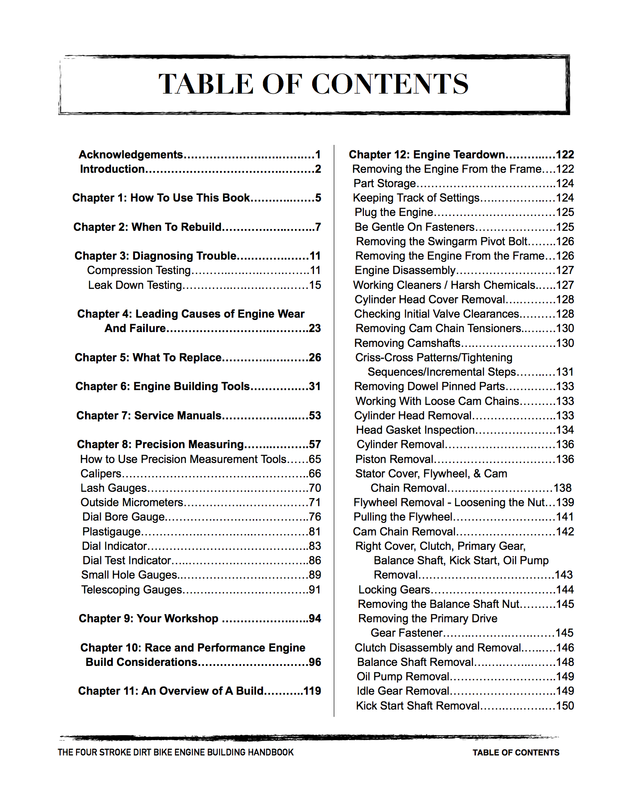 It is a hefty book filled full of engine building knowledge. Absolutely, once your book ships it will be emailed to you. 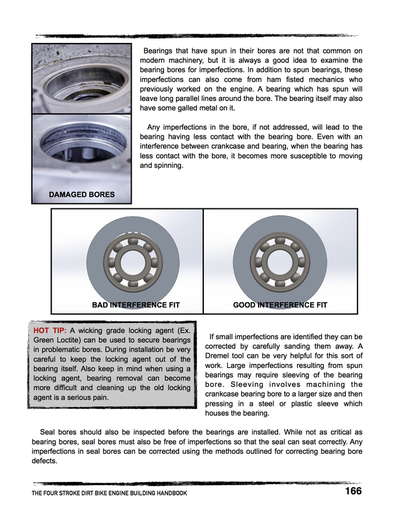 What are guys saying that have used the 4T Handbook? 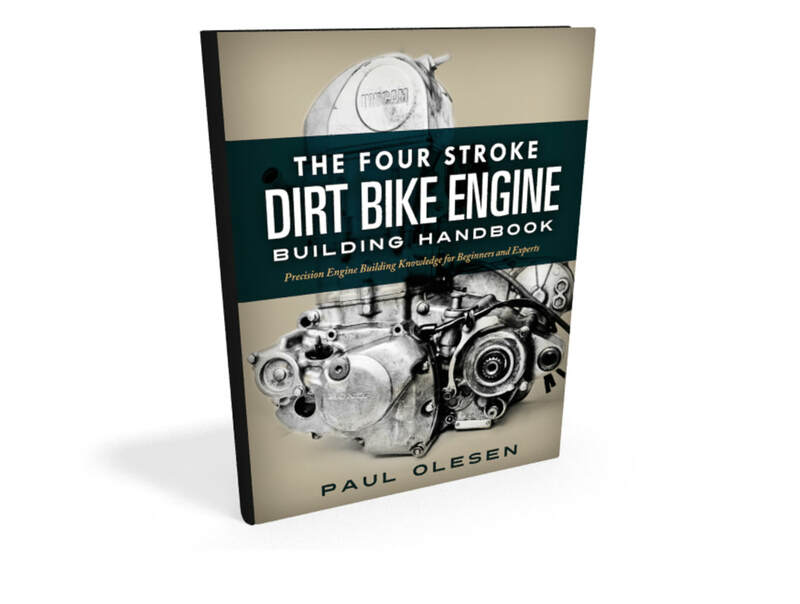 I'm proud to say that in the short time the book has been available over 720 riders have read it and successfully rebuilt their engines! We have been sent hundreds of amazing testimonials. You can check out our reviews on Thumpertalk too! I want to pay with Paypal but it wants me to pre-approve my account. What's this all about? I apologize for your customer’s alarm. That messaging is put in place by PayPal, not us, and as a result it seems fairly scary. Then they would not have to login to PayPal again. That’s it. Nothing devious or dastardly about it. It works the exact same was as when you buy a product on Amazon or Ebay. If you have an account on those platforms, you don’t have to enter your payment information every time. This is your everyday kind of online payment, it just has been presented in a very weird way by PayPal. ​Yes you absolutely can. 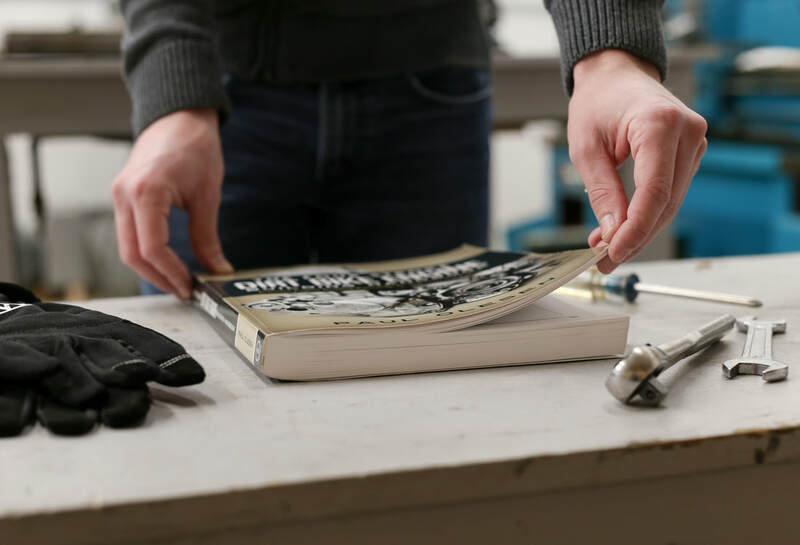 We offer a Bundle of the Two and Four Stroke Handbooks in print, as well as a Mega Bundle of both the print and eBook versions of the Two Stroke and Four Stroke Handbooks. 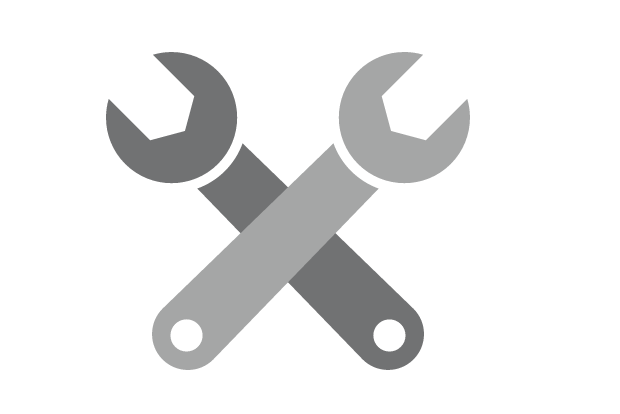 Scroll back up to select those options for your shopping cart. 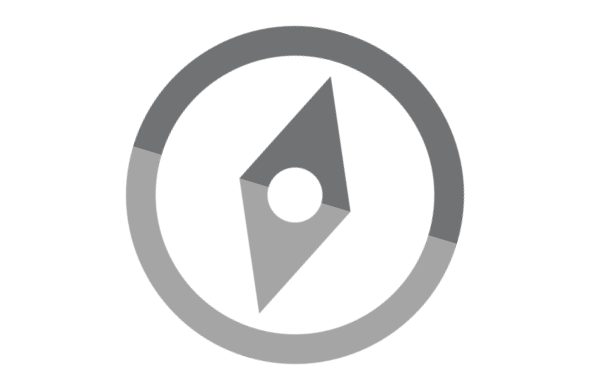 Or Click here to check those options out. 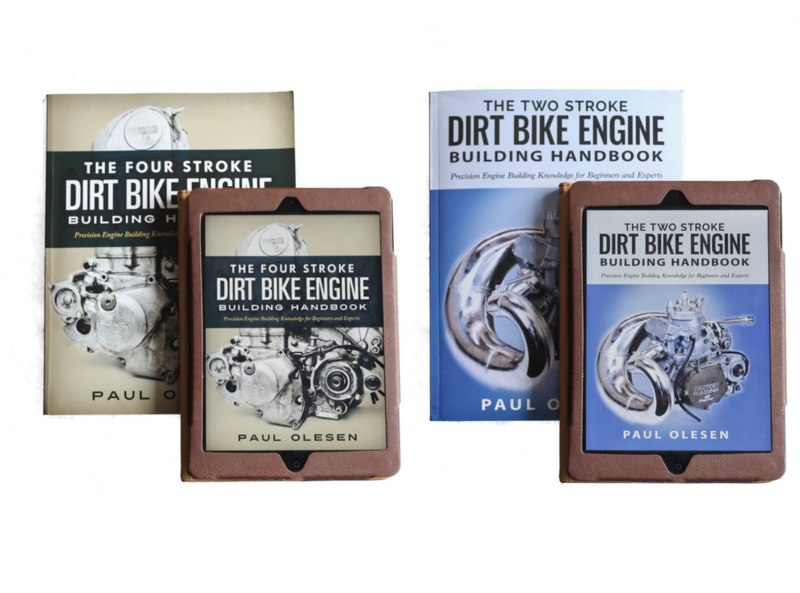 WANT TO CHECK OUT MORE OF OUR DIRT BIKE BOOKS? CLICK HERE!